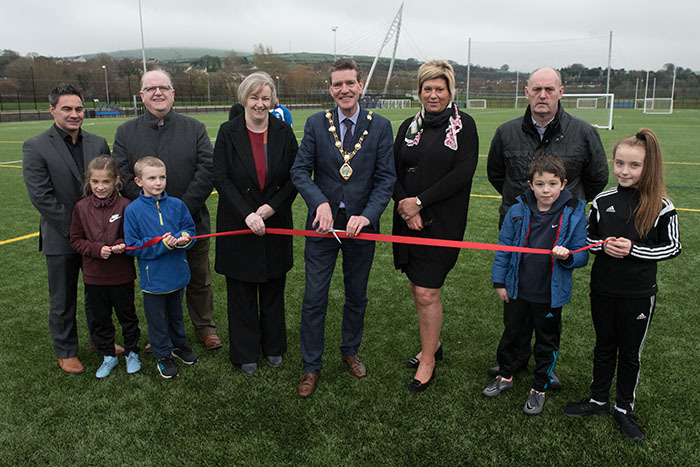 Sports people in Strabane can now access state of the art play provision on their doorstep after Mayor of Derry City and Strabane District Council, Councillor John Boyle, officially opened the new multi-sport 3G facility at the Melvin Sports Complex. The £1.2 million project will cater for primarily football, rugby and GAA and is an addition to the wide range of facilities at the centre that includes a sports hall, studios, conference rooms, cryospa, soft play, play park, tennis court, and running track. The pitch is named after the late Felix McCrossan, the former soccer referee and linesman in the Irish League who had a pivotal role in the growth of the Tyrone Milk Cup tournament. Funders, stakeholders, elected representatives and Council officers attended December’s opening event where local schoolchildren took part in a Melvin Multi Sport Festival on the pitches that was delivered by Council’s team of sports coaches. Speaking at the opening, Mayor Boyle expressed his delight that local people could now access state of the art playing facilities on their doorstep. “I am delighted that sports people of all levels can now access this high spec and state of the art facility that can significantly contribute to our aim of increasing participation numbers in sport and physical activity across the Council area,” he said. “The Felix McCrossan Pitch provides much needed playing provision for the area and can act as a hub for the community, encouraging more active lifestyles choices and creating a space for groups and teams to come together and socialise through sport. Director of Health and Communities at Derry City and Strabane District Council, Karen McFarland, said the project was the latest upgrade to the overall offering at the Melvin Sports Complex. “The completion of the 3G facility is a welcome addition to the facilities at the Melvin centre,” she said. “The investment compliments the £2.2 million refurbishment at the Complex in 2014 and the £60,000 upgrade to the Arena Grass Pitch and changing facilities. For further information on prices, activity programmes / timetables or general enquiries contact the Melvin Sports Complex on 028 71 382660, e mail melvin@derrystrabane.com or visit www.derrystrabane.com/melvin-sports-complex.